Eleven charities have been fined by the UK's data watchdog for misusing information about millions of past donors to seek further funds. Those fined include Oxfam, Cancer Research UK, The Royal British Legion and Battersea Dogs' and Cats' Home. The Information Commissioner's Office said offences included secretly piecing together data from various sources and trading personal details to target new and lapsed donors. It said charities must obey the law. But it limited the individual fines to between £6,000 and £18,000 because donors could be unhappy at more punitive fines. "[People] will be upset to learn the way their personal information has been analysed and shared by charities they trusted with their details and their donations," said Information Commissioner Elizabeth Denham. "No charity wants to alienate their donors." The regulator said that some of the charities had hired companies to profile the wealth of their donors. It said this was done by investigating their incomes, lifestyles, property values and friendship circles among other means. In some cases, the "wealth screening" process was also used to flag those most likely to be convinced to leave money in their wills. Some charities are also accused of tracking down additional data about past supporters - for example using old telephone numbers to identify current ones. This ignores the fact people have the right to choose what information they share. In addition, some of the charities shared data with each other without seeking permission. "Supporters of animal charities could have their information shared with homeless, humanitarian or religious charities even though the supporters only expected their information to be shared with other animal charities," the Information Commissioner's Office said. "Some charities don't know if the information has been shared one or 100 times. This can result in lots of unwanted charity marketing." The Information Commissioner's Office carried out the probe after reports that charity supporters were being pressured into follow-up donations. 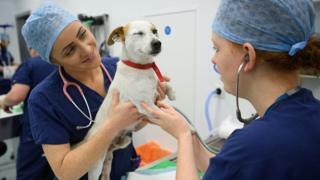 Last December, the British Heart Foundation and The Royal Society for the Prevention of Cruelty to Animals were fined for similar activity. The Charity Commission for England and Wales - another regulator - said it was now investigating whether follow-on action needed to be taken against individual trustees. "The generous British public expect charities to safeguard their data and raise funds responsibly, and in return they donate in their millions," said the commission's chief operating officer David Holdsworth. "Sadly in these cases charities have not kept their side of the bargain. "We are working with the charities concerned, the Information Commissioner and the Fundraising Regulator to ensure that any necessary remedial action is taken." You might think that fining charities for being a bit too eager to solicit donations is rather unfair. But make no mistake, the kind of offences that the Information Commissioner uncovered are seen by the regulator as very serious breaches of the Data Protection Act. They would have probably meant far more serious penalties for commercial organisations. Piecing together information from other sources not provided by donors, ranking people according to their wealth, and in a couple of cases trading data with other charities all meant that millions might have received marketing approaches they did not expect or want. One of those fined, the NSPCC, said it was disappointed by what it regards as an unjustified punishment. But the Information Commissioner hopes that charities will now be aware that they have to be just as careful with personal data as any business.